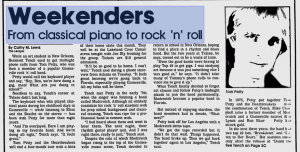 While an art student in New Orleans, Benmont Tench used to get midnight phone calls from Tom Petty, who was then a member of a popular Gainesville rock 'n' roll band. Petty would call the keyboard player and say, "Hey, Ben, we're here doing a gig, man! What are you doing in school?" Needless to say, Tench's career at Tulane didn't last long. The keyboard whiz who played classical piano during his childhood days in Gainesville -- while listening to Elvis and the Beatles on the stereo -- has been with Petty for more than eight years. "And I'm overjoyed. Here I am playing in my favorite band. And we're doing all right," Tench says. "It feels great." Tom Petty and the Heartbreakers will end a four-month tour with a blitz of their home state this month. They wll be at the Lakeland Civic Center arena tonight with Joe Ely fronting for the group. Tickets are $10 general admission. "It'll be so good to be home. I can't wait," Tench said during a phone interview from Atlanta on Tuesday. "It feels great knowing we're going back to Florida, especially playing Gainesville. All my folks will be there." Tench met Petty in the early '70s when the singer was forming a band called Mudcrutch. Although an unlikely candidate for rock 'n' roll stardom with his prep school background and classical training, Tench was ripe for a professional band to connect with. "I had heard about them and went to hear them. The next night, their rhythm guitar player quit. And I was right there, ready to jam," Tench said. 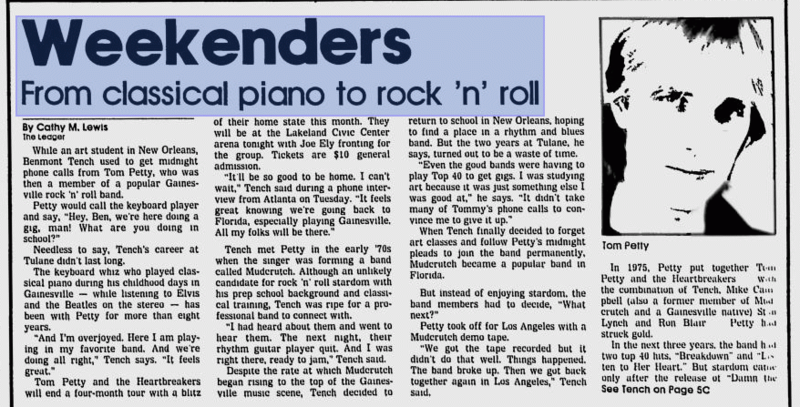 Despite the rate at which Mudcrutch began rising to the top of Gainesville music scene, Tench decided to return to school in New Orleans, hoping to find a place in a rhythm and blues band. But the two years at Tulane, he says, turned out to be a waste of time. "Even the good bands were having to play Top 40 to get gigs. I was studying art because it was just something else I was good at," he says. "It didn't take many of Tommy's phone calls to convince me to give it up." When Tench finally decided to forget art classes and follow Petty's midnight pleads to join the band permanently, Mudcrutch became a popular band in Florida. But instead of enjoying stardom, the band members had to decide, "What next?" Petty took off for Los Angeles with a Mudcrutch demo tape. "We got the tape recorded but it didn't do that well. Things happened. The band broke up. Then we got back together again in Los Angeles," Tench said. In 1975, Petty put together Tom Petty and the Heartbreakers. With the combination of Tench, Mike Campbell (also a former member of Mudcrutch and a Gainesville native), Stan Lynch and Ron Blair, Petty had struck gold. In the next three years, the band had two top 40 hits, "Breakdown" and "Listen to Her Heart." But stardom came only after the release of "Damn the Torpedoes" in 1980, an album that reached No. 2 on the charts and, according to Rolling Stone magazine, turned Petty into "the most authentic all-American rock hero this side of Bruce Springsteen." With the album's release, Petty also gained the reputation of being a rebel -- enduring nine months of court appearances when MCA records attempted to claim rights to his ABC contract upon ABC's demise. Petty filed for bankruptcy and finally signed with Backstreet, an MCA affliate. It was the first in a series of scrapes Petty has found himself in since his career has skyrocketed. The most recent one delayed the release of his current album "Hard Promises." When MCA attempted to release the album to sell at $9.98 instead of the standard price of $8.98, he threatened to withhold it and urged fans to write letters. Because of the variations in style in "Hard Promises," reviews of the band's latest product have suggested that Petty may be out of his element this time. But Tench says the Heartbreakers have always been versatile. "We've always done the type of things we included ont he album, we just haven't recorded any of it before." Tench isn't worried that the band will lose any of the following gained with the release of "Damn th Torpedoes," despite the musical changes in "Hard Promises." "It may take some time but people will catch up. They will catch onto what we are doing," he said. "We're playing to young crowds, yes. But we're also player to older rockers, too, people who grew up on it. They've been through changes before. They'll stay with us."